Why not enjoy a little sweet breakfast with candy canes, chocolate, and marshmallows?! Each year, I try to make a really good breakfast for Christmas morning. I typically make cinnamon rolls and wake up way too early to do it, so last year I wanted something simpler. 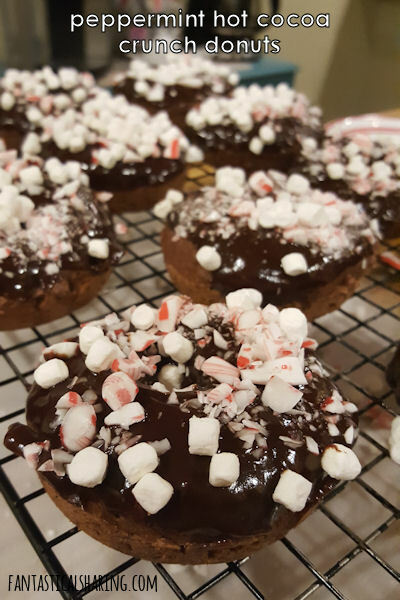 My kids love donuts and I knew that peppermint chocolate ones with marshmallows would be really special for them. I thought they were pretty fantastic too. I loved the chocolate donut with slight peppermint flavor added to it and the chocolate glaze too! The glaze was wonderful. In a large bowl, whisk flour, hot chocolate mix, cocoa powder, brown sugar, and baking powder. In a small bowl, whisk buttermilk, egg, yogurt, melted butter, and peppermint extract. Pipe or spoon batter into a greased donut pan about 2/3 of the way full. Bake in a preheated 350 degree oven for 8 to 10 minutes or until a toothpick inserted in the middle comes out clean. Remove pan from oven and set on a wire rack. Cool in pan for 5 minutes, then remove from pan to the wire rack directly. While the donuts are cooling, make your glaze. In a medium saucepan, melt chocolate chips, butter, honey, and milk together over medium-low heat, stirring frequently. Once melted, stir in vanilla until mixture is smooth and glossy. Reduce heat to low. Dunk donut tops into glaze and then immediately sprinkle with crushed peppermint and marshmallow bits. Rest until glaze sets. Serve. Peppermint and chocolate are the perfect pair and I adore these Dark Chocolate Peppermint M&M Cookies from a few years ago. If you aren't the biggest fan of peppermint, check out these Dark Chocolate Baked Donuts from Hostess at Heart.